Gourmet food market owner Erin Murphy is determined to get Jewel Bay, Montana's, scrumptious local fare some national attention. 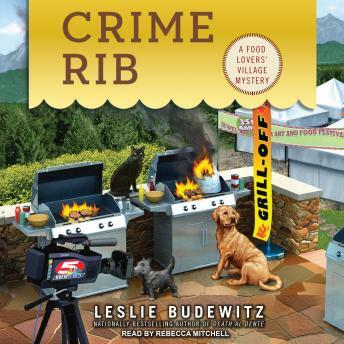 But her scheme for culinary celebrity goes up in flames when the town's big break is interrupted by murder . . .
Food Preneurs, one of the hottest cooking shows on TV, has decided to feature Jewel Bay in an upcoming episode, and everyone in town is preparing for their close-ups, including the crew at the Glacier Mercantile, a.k.a. the Merc. Not only is Erin Murphy busy remodeling her courtyard into a relaxing dining area, she's organizing a steak-cooking competition between three of Jewel Bay's hottest chefs to be featured on the program. But Erin's plans get scorched when one of the contending cooks is found dead. With all the drama going on behind the scenes, it's hard to figure out who didn't have a motive to off the saucy contestant. Now, to keep the town's reputation from crashing and burning on national television, Erin will have to grill some suspects to smoke out the killer . . .